OUR BESPOKE NON-EMULSIFIERS WORK TO CONTROL THE FORMATION OF EMULSIONS IN YOUR ACIDS, DRILLING FLUIDS AND BRINES. Emulsions can form downhole between the reservoirs hydrocarbons and water based drilling fluids to block the wellbore. 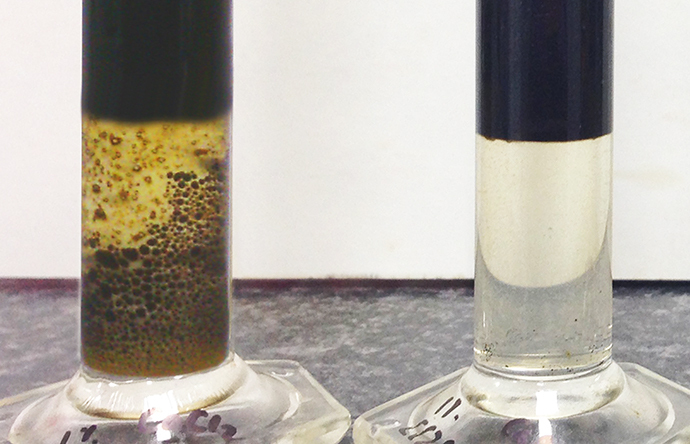 Using Aubin non-emulsifiers will ensure that your wells can operate at maximum production after cleanup. Insoluble sludge deposits are formed by some crude oils when contacted with acids or completion fluids, and partial or even complete plugging of a producing zone may occur. Our non-emulsifier product SS-940 acts as a colloid stabiliser and functions to prevent the coagulation of unstable colloidal material present in some crude oils. Our non-emulsifier product SS-940 acts as a colloid stabiliser and functions to prevent the coagulation of unstable colloidal material present in some crude oils.